← More wine, less whine. Hey! I bet even I could make these. My baking skills are very limited and scones are one of those items I thought I’d always buy and never bake. Not anymore. And if someone asks where I learned to make scones, I’ll tell ’em Martha showed me — no, not that Martha. Thanks! These look beautiful and delicious! I love the idea of savory scones. So, so good! Sounds so good and easy! I will have to try these and top it with some homemade strawberry jelly. Yum. Thank you! Oh yes. i forget … strawberry jam and whipped cream on top.. how could I have forgotton! thank you for reminding me.. is it unethical to go back and write a PS? These look and sound delicious! Even more delicious, perhaps, is the description of the conviviality (and that includes the vicarious kind of the wallflower Martha contributing from the sidelines and listening in) in your home-by-the-bay. I’m a coastal girl by upbringing myself and the image of that room with the expansive water views is, well, delicious. I loved your story, it almost felt like I was sitting there with you in the kitchen! You’re a great story teller! 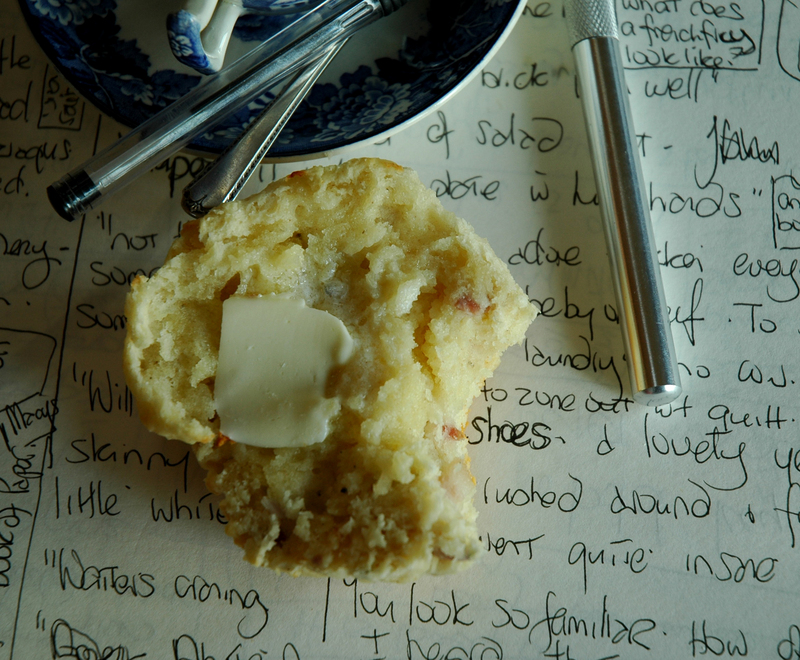 Plus… a scone recipe that I am going to have to try this morning! Thanks! May have to give this a try too! You give great background on your posts. What a great idea! I never thought to grate the butter into the flour. Well it makes it speedier, and you know how i am the lazy shortcut one in the kitchen! OK, as much as I love your posts, I have to admit, I spent a good chunk of it trying to say scones in a New Zealand accent. I know, I’m terrible! The scones look great, really great. I say it the same way as you! I love scones but have never had too much luck with them but you make it sound so simple and straightforward. I want to be in your kitchen with you…Í´d let you read your books in peace! C, you always bring a smile with your memories and your recipes! And, what luck! I need something to make for breakfast in the morning…hmmm, sweet? Or savory? Yum!!!! Always a good time for baked goods! Thank you for sharing this nice happy mamory with us. Those scones look delicious with an easy recipe too. The word “scones” is sung as a dotted quarter note – longer than the surrounding words for emphasis! Scones, scones, scones! Love them, love them. Lashings of jam and whipped cream, yes please. I only finally managed to get them right this year. Before that they were always hit and miss…actually mostly miss. My mouth is watering! They look delicious. Your longs (read scones) look incredible! Bacon, onion and cheese on top – YES PLEASE!!! Lovely read as always C.
My husband is British and his mother made scones when she was a girl working in a B&B in England. I still cannot get the hang of it, but will give your recipe a go. Next is the clotted cream!! I believe scones are best made at home where “love” and “care” are additional ingredients not necessarily found commercially. Made my hungry! I really enjoyed your story! hank you for sharing this recipe. I cannot find scones in Italy.I guess it is a British tradition. I don’t remember when was the last time I has a delicious scone!!! Great post!! Hi Cecilia. I have never had much luck baking scones but I am sitting here now on a hot and stormy afternoon having just baked the best batch of scones EVER in my life. I followed your recipe exactly and they are amazing. Have taken some snaps so will post them soon. You are my scone heroine – thank you! i always say that nothing home made can be bad for my diet.. well it works for me!! I never eat processed food you see. So i can only blame myself! I love your recipes. I don’t have to worry about needing to find a substitution for an unnatural ingredient. This has been my first yr of really getting into cooking. I couldn’t afford to get the little extras a good cook normally has always in the kitchen. So this Summer, when I finally was able to get almost all the usuals (my last shopping trip for the extras to have around will be this morning) I was finally able to make my first scones! I made cheese ones, and the first batch put far too much pepper I couldn’t finish my second one. The second batch was good enough to share though, and have for breakfast! What a treat: my favorite of all times: scones. There used too be a shop in Greenwich Village called Balducci’s, which made wonderful, crumbly scones. Most of the others I taste now that the original Balducci’s is out of business have a different texture: more doughy than crumbly. From what I’ve read the secret is to make them with cream rather than milk so they won’t get too dry. But using cream is an insult to my sense of healthy eating. Too much cholesterol and too many calories. 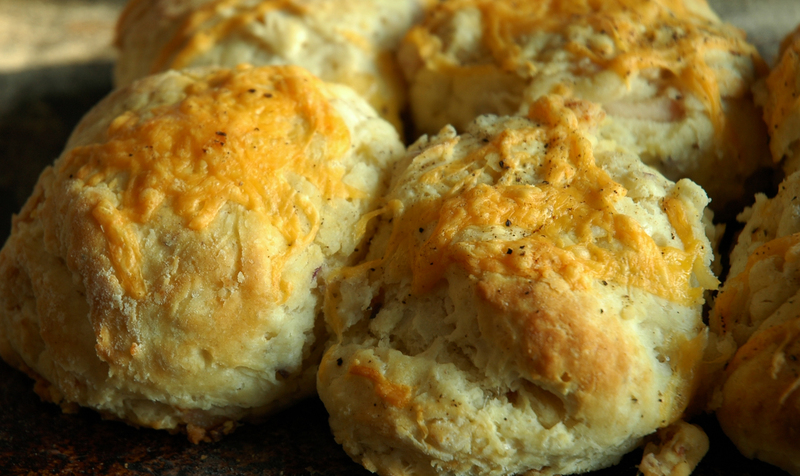 How would you describe the texture of your scones?